Here’s me, jumping on the bandwagon. These are the posts with the most views during 2012. We’ll do it countdown style to build the suspense. Enjoy this stroll down memory lane! 10. Physical Friday: Let’s Make Drums! 7. Joshua 24:15 This was the scripture for 2012 in Primary. 4. Primary Sharing Time Journal 2012 This was a lot of fun to do with the Primary kids over the year to help reinforce the principles, scriptures, and songs learned each month. I did not make an updated version for 2013. Sorry. But I believe Sugardoodle has something similar for this year. 3. This Year’s Big News This is actually from 2010 when we announced that Scott was joinging our family, but seems applicable since we are adding another baby to our family this June! I graduated from BYU without the famous MRS degree. I did, however, study Marriage, Family, and Human Development so when the opportunity arose, I would have some idea of what a marriage should look like (I grew up in a single-parent home). I actually found a job in my field of study, much to my mother’s amazement. And to her delight it was about 25 minutes from her house back in Colorado. I worked as a professional research assistant which just sounds so…professional! But the call to school was strong and I returned to pursue a master’s degree in applied linguistics. Again, my mother wondered what on earth I would do with that! But this time I had a plan. I would travel the world teaching English. I would have income where ever I chose to live and I could see the world. Best plan ever. Until I met Brent. I finished up my master’s degree the semester after we married. I taught at a university and a local vocational college. My professional career was underway and I was pleased with my earning potential, even if we weren’t leaving the country anytime soon. Then we discovered we were going to add a new member to our family. Her due date was actually two days after the term ended so it was a perfect way to feel complete when I left the workforce to become a stay-at-home mom. My husband has been in school our entire married life minus one semester after Sammi was born that we tried to work out how to finish up his pre-reqs for medical school. Student life is hard in general and even harder financially. I had the opportunity to teach for two semesters at a local college, but the time away from Sammi, worrying about her and having child care be difficult to keep consistent with friends watching her just wasn’t worth the opportunity. After two semesters I knew that my primary responsibility was to be home with her. I was strengthened and confirmed in this decision by The Family: A Proclamation to the World. ” Mothers are primarily responsible for the nurture of their children.” It felt awfully hard to nurture her when she spent so much time away from me at such a young age. I needed that experience when she was young and before we added any more children to our family to really know and be committed to staying home with our children. Fast forward a few years and we’d added a second daughter to our family. My husband had been accepted to medical school and we moved across the country from Utah (where we were surrounded by family) to Tennessee. Things were even tighter as we had less income and more people in our family. I had started blogging and wrote an ebook (which is now available free here.) It felt like everything I tried to do to add income to our family just cost us more money! Then Brent started a website for osteopathic med/premed students. In all ways that you measure online “success” his website left my little blog in the dust. I had worked so hard on this baby of mine and it was hard to feel like he was more successful than me. I started to resent that and the time he spent away from us studying. I went through a dark time of struggling to understand how to find joy in our situation. Again, the Proclamation offered counsel and comfort. “Fathers…are responsible to provide the necessities of life and protection for their families.” When I finally let go of my wounded pride and read that with the Spirit I was taught a powerful lesson. I grew up a very independent child of a single-mother who had returned to school when I was little and completed her GED, Associate’s, Bachelor’s and Master’s degrees by the time I was 10. She was so blessed to have success in her endeavors to provide for our family. She had no alternative but to provide and she worked as hard as she could to be worthy of and prepared to receive the blessings the Lord had in store for our family. But my situation was different and the Lord needed me to know His will for families and to trust His plan for our little family that now included a son. In those dark and lonely nights with Brent away studying and the little ones sleeping I had many conversations with the Lord. They began as rants, adult-sized temper tantrums, but slowly moved to desperation to rid myself of my negative feelings of resentment and bitterness, and then to calm and honest soul-searching to truly have a change of heart. The Savior was with me through this lengthy process and never abandoned me. Those dark nights weren’t so lonely anymore and I had comfort in knowing I was trying to improve my weaknesses. I still fall short of the ideal nurturer. I still have temper tantrums. But they are less frequent and shorter lived. It’s a long road to perfection, isn’t it? I cling to the counsel in the Proclamation to continue a forward progression with our family. “Happiness in family life is most likely to be achieved when founded upon the teachings of the Lord Jesus Christ. Successful marriages and families are established and maintained on principles of faith, prayer, repentance, forgiveness, respect, love, compassion, work, and wholesome recreational activities.” As a family we are happier and more peaceful when we read the scriptures daily, kneel in prayer together, and have lots and lots of tickle attacks. I am so grateful for the patience and forgiveness of my husband and our children. It would be hard to face each new day if I didn’t have faith that I could do it better than I did the day before. I am grateful to a loving Savior for the ability to repent and change not only my actions but my heart as well. What helps you face each new day with courage? 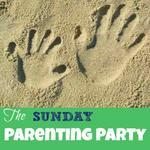 Today I’m linking up with the Family Proclamation Celebration at Chocolate on My Cranium, We Talk of Christ, Diapers and Divinity, and Middle-aged Mormon Man. The kids licking the plate of funnel cake clean! This week we enjoyed the county fair (3 years running! That’s a tradition now), dance classes and playing with friends. I’ve also really enjoyed several blog posts this week and thought I’d share a few with you. Last year we homeschooled Sammi for Kindergarten. Elli and Scott came along for the fun of it 🙂 Our “back to school” celebration was fairly non-existent since we hadn’t gone back to school yet and we weren’t technically going any where. After moving to a new city this summer, both girls were registered for school. My heart has been very heavy over this decision. While I seriously considered homeschooling again, and even got excited about the possibility, in the end, the girls really wanted to GO to school and we decided as a family it was a good year to try that route out. Since we were committed, I wanted to make it special for Sammi and Elli to go to school. Brent helped me and we found several cute ideas for back-to-school breakfasts and picture ideas. Then we scavenged our stashes for school related decorations we could use. Brent offered to get up early to make pancakes, Sammi’s favorite. Since Sammi would be gone (and Elli, too, starting next week) most of the day, I really wanted to create a morning routine that included a spiritual start to her day. I came up with a morning devotional that was simple enough to do every day but that would get her started with a prayer in her heart and a song on her lips. We sing a Primary song they are learning for their program this fall, read an excerpt from a scripture verse that they can memorize over the week, and have a spiritual thought, a short story or quote that illustrates a gospel principle or doctrine. I also found some cute images to color while they wait for breakfast to be served. So far this has been very successful! We set the table with little place mats and a back-to-school basket of gifts. These were all things I had already but hadn’t given out yet. Unfortunately Elli slept late on Sammi’s first morning so I don’t have a picture of her. But her first day of preschool is next week and so we’ll have something special for her that day. Scott enjoyed his gift and loved coloring. He is showing the same kind of interest and dedication to coloring, cutting and crafting that Sammi did at this age. So fun! After breakfast, Sammi donned her backpack and we went outside for a picture. She sure is a cutie. Then it was off to school. She found her name on the door of her classroom and then found her seat. Good luck this year, sweetie. We’re cheering you on! Do your kids go off to school? What do you do to make your time together special? I have never gone all out on party decorations before. Usually I’m still trying to get cleaning done as guests arrive. So this year felt extra special because of all the help I had to get it all done and how wonderful it turned out. I really liked how everything looked. And now we have a gold clock hanging back in our bathroom. It’s just too cool. Makes me want to spray paint the wall silver! After snacking for a while the girls made their New Year’s self with party hat and blower. They seemed to enjoy it and it was simple enough that all the girls finished theirs. While they were working on that, the grown ups were blowing up all the balloons I didn’t use in decorations. Once that balloons were blown up and the kids played with them for a bit we decided to do the kiddie countdown earlier than originally planned. It worked perfect though. We did the countdown at 8:3, popped all the balloons (my favorite NYE tradition) then headed outside to do some fireworks provided by a family that came to the party. All the kids did tons of sparklers, including Scott who was mesmerized and didn’t even try to put it in his mouth. There were some bigger fireworks and then we headed back inside. Three little girls got jammies on and snuggled up in Elli’s bed. Scott and Brady fell asleep and shared the crib. Jaylee fell alseep in her Daddy’s arms and was snuggled into our bed. Then the games began. Brent was such a trooper and played all sorts of games with the older kids: Chutes and Ladders and The Tinkerbell Game. The grown ups played the sign game. I remembered that I am really not good at that game but it is fun just to laugh and relax with friends. I love the mirror ball and plan on keeping that safely tucked away for next New Year’s Eve. It was just the right length for the tall guys to bump their heads on it, but no one seemed to mind too much. Sammi made it all the way to midnight. It was fun to have her sit on my lap and Brent at my side as we counted down to the new year. Lots of kisses and hugs. Then jammies and bed for the rest of us. Overall, I feel blessed to have ended 2011 on such a great note and to have begun 2012 with friends and loved ones in out home.